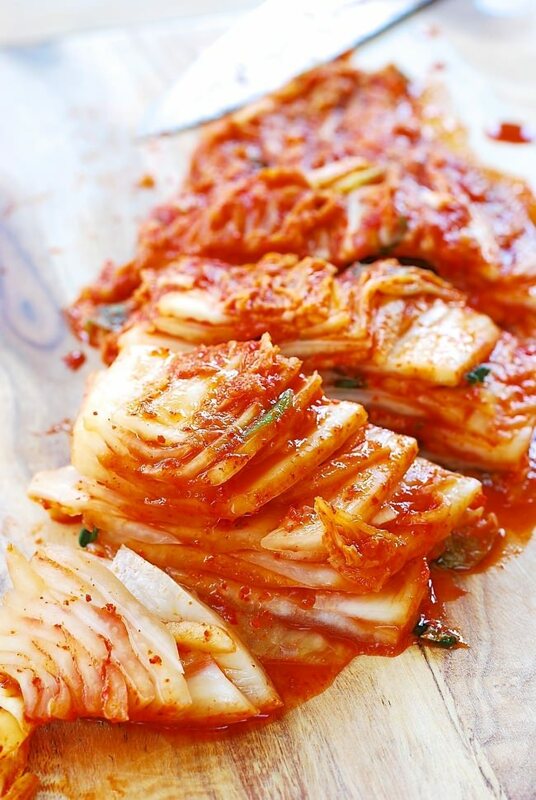 Traditional napa cabbage kimchi is the most iconic kimchi dish in Korean cuisine. Learn how to make this kimchi with easy to follow instructions and step-by-step photos! You’ll find surprisingly easy to make delicious kimchi at home. I probably don’t need to tell you that kimchi is the best-known Korean dish, and Koreans eat it literally everyday with every meal. Kimchi is basically a catch-all Korean term for fermented vegetables. 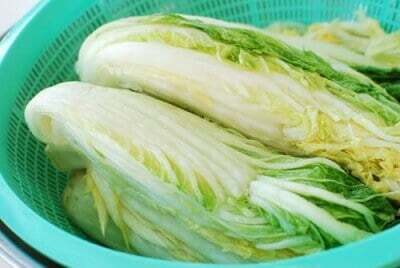 There are hundreds of kimchi varieties in Korea, but this napa cabbage kimchi is the most common variety. 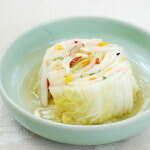 In this Korean kimchi recipe, I will show you how to make traditional napa cabbage kimchi, aka. pogi kimchi. I usually make this Korean kimchi recipe with 5 – 10 cabbages at a time. Why so much? Besides the fact that we Koreans eat kimchi every day, I am a typical Korean mom who makes a massive amount of kimchi to supply to my grown-up children. Both my mother and mother-in-law did that for us for a long time, so I am definitely continuing the tradition. Also, my family loves every dish made with well-fermented kimchi, such as kimchi jjigae, kimchi mandu, kimchi bibimguksu, kimchi fried rice, kimchi jeon, tofu kimchi, etc. To help you start making kimchi at home, I came up with a recipe using one napa cabbage. 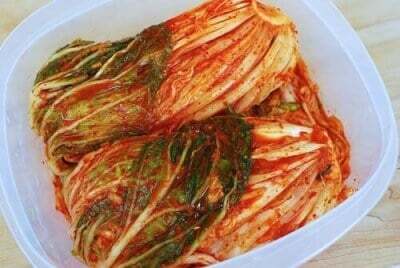 Through this Korean kimchi recipe, I hope you’ll find that it’s really not that difficult to make good cabbage kimchi at home. It may look complicated at first, but it really requires no special skills – all you really need is patience. As I mentioned in my kkakdugi recipe, kimchi tastes vary widely, depending on the types, quality, and ratio of the seasoning ingredients. Every household has its own methods. Making better kimchi is a frequent conversation subject when my middle-aged Korean friends get together. Various jeotgal (salted seafood) are used in kimchi for the distinct pungency and depth of flavors and to aid the fermentation process. Saeujeot (salted shrimp) and myulchiaekjeot (fish sauce made with anchovies) are the two that are most commonly used. Koreans use Korean sea salt to salt vegetables to make kimchi. It’s natural salt with a coarse texture that’s minimally processed. 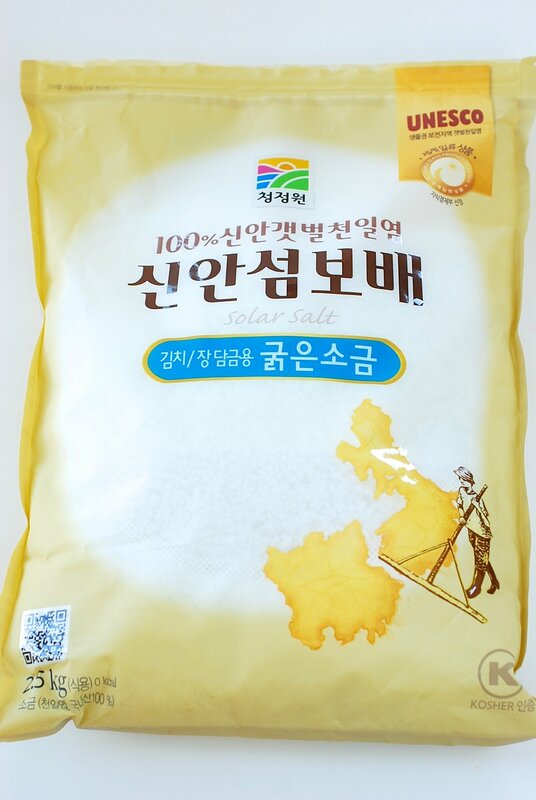 The coarse sea salt is commonly referred to as gulgeun-sogeum (굵은소금), meaning coarse or thick salt. The salt is used mainly for salting vegetables for making kimchi and for fermenting condiments such as doenjang (Korean fermented soybean paste) and gochujang (Korean red chili pepper paste). This salt tastes good without bitterness, so it helps develop flavors in fermented foods. If Korean sea salt is not available, you can use your normal kitchen salt, which has finer grain. When we first came to America, Korean sea salt wasn’t available, so we used normal salt to salt the cabbages. Be sure to use less (about 1/4 less than the amount called for in the recipe) if using finer salt. For seasoning kimchi and other food items, Koreans use refined sea salt. Although you can start eating your kimchi any time, it needs about two weeks in the fridge to fully develop its flavors. Your kimchi will continue to age in your refrigerator and will be delicious for a couple of months. The kimchi will last much longer than that. 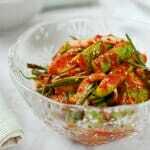 It will turn very sour over time, and sour kimchi can be used in many delicious dishes! If you want to make vegan kimchi, skip shrimps and swap fish sauce for soy sauce. Or simply head over to my blog post on how to make vegan kimchi. Not a fan of cabbage? Try my Cucumber Kimchi, my Green Onion Kimchi or this refreshing Cubed radish Kimchi. This Korean kimchi recipe shows you how to make traditional Napa Cabbage Kimchi - with easy to follow instructions and step-by-step photos to get perfect crunchy, tangy, spicy, and delicious homemade kimchi. In a large bowl, dissolve 1/2 cup of salt in 5 cups of water. Thoroughly bathe each cabbage quarter in the saltwater one at a time, shake off excess water back into the bowl, and then transfer to another bowl. Using the other half cup of salt and starting from the outermost leaf, generously sprinkle salt over the thick white part of each leaf (similar to salting a piece of meat). Try to salt all the cabbage quarters with 1/2 cup salt, but you can use a little more if needed. Repeat with the rest of the cabbage quarters. 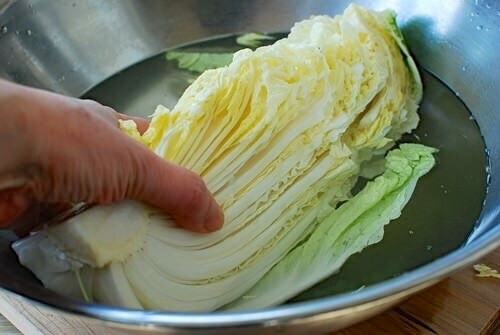 Pour the remaining salt water from the first bowl over the cabbage. Set aside for about 6 - 8 hours, rotating the bottom ones to the top every 2 - 3 hours. The cabbages should be ready to be washed when the white parts are easily bendable. Rinse thoroughly 3 times, especially between the white parts of the leaves. Drain well, cut side down. Meanwhile, make the glutinous rice paste and cool. Prepare the other seasoning ingredients. Mix all the seasoning ingredients, including the rice paste and water (or dashima broth), well. Set aside while preparing the other ingredients in order for the red pepper flakes to dissolve slightly and become pasty. Cut the radish and optional pear into matchsticks (use a mandoline if available). Cut scallions into 1-inch long pieces. Transfer to a large bowl and combine with the seasoning mix. Mix well by hand. Taste a little bit. It should be a little too salty to eat as is. Add salt, more salted shrimp or fish sauce, if necessary. If possible, let it sit for 30 minutes to an hour to allow the flavors meld nicely. Fold the leaf part of the cabbage over toward the stem and nicely wrap with the outermost leaf before placing it, cut side up, in a jar or airtight container. Repeat with the remaining cabbages. Once all the cabbages are in the jar or airtight container, press down hard to remove air pockets. Rinse the bowl that contained the radish mix with 1/2 cup of water and pour over the kimchi. Leave it out at room temperature for a full day or two, depending on how fast you want your kimchi to ripe. Then, store in the fridge. Although you can start eating it any time, kimchi needs about two weeks in the fridge to fully develop the flavors. It maintains great flavor and texture for several weeks. Thank you, J! It was my great pleasure and honor! I am so happy to get to know you more through the guest post as well. Cheers! absolutely wonderful post. i especially love that first photo with the gorgeous slice of baechu kimchi! by the way, do you use a kimchi refrigerator? Thank you, Erica! No, I don’t have one. I wish I do. But, I do have an additional fridge that I keep all my kimchi. Great to see you! Cynthia – You’re so kind! Hope you can find napa cabbages there. If you like kimchi, the effort is definitely worth it. Thanks for stopping by. Your kimchi looks fantastic! Homemade is always so much better than store-bought. Looking at yours make me want to make some real soon. Absolutely, Biren! Homemade is much better and less expensive. I know you make good kimchi. 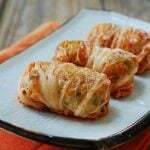 Hope you’ll try this recipe next time and let me know how you like it. Thanks! Charles – Don’t let that stop you from making kimchi. It will still taste good. You can use Japanese Mochiko if available. It looks like this: http://www.amazon.com/Koda-Farms-Mochiko-Sweet-16-Ounce/dp/B005DX8YJS/ref=cm_cr_pr_sims_t. Thanks for visiting! Or I just make the powder from rice… blend it like coffee beans and pass through a sieve. I also add half a sheet of sushi sea weed in stead of kelp in the water. Ray – Thank you so much for your generous words! Wow, I am a little intimidated right now. I would love to try it though! It’s really not that bad. And it will definitely get better with practice. You can do it! Thank you, Stephanie! That was one of my goals for this post to show it’s not all that bad, especially when you only make 1 cabbage. Great to see you again! Hyosun, your kimchi looks like a masterpiece. If you saw my struggle with this traditional cabbage kimchi you would understand why I jumped with joy discovering mak kimchi. I think it’s very difficult to spread the mixture between the leaves and am completely mesmerised by your accomplishment. Sissi – I hope you give it another chance. I am sure it will be better next time. Nothing wrong with mak kimchi. It’s very convenient, but this stuffing method makes kimchi taste much better for some reason. That’s why this tradition version is most popular kimchi in Korea. No pressure though! ha ha. Hyosun, I ma grateful for your encouragement. I will certainly try it once more. If you say it’s more flavoursome, I believe you and since mak kimchi is already quite good, I can only imagine how excellent the real cabbage kimchi is! I have to concentrate and learn to do it. I have no doubt you will implement this beautifully and impress your husband and friends. Oh I know your mom will be so proud of you as well if you make this next time she visits. Thanks! Sounds incredible with napa cabbage, i bet the flavors are terrific. Thank you! Kimchi definitely is an acquired taste. But, once you do, you will never be able to go back. My wife and I absolutely love everything about kimchi and you have given us another recipe to try and enjoy. Thanks so much for sharing! sportsglutton – Thank you! I hope you and your wife try making kimchi at home. It will be fun and rewarding! Enjoy! Thank you, blu4sky! Nice to meet you. Hope you make it at home one day. It will be well worth it! i’m from malaysia. I came across your blog from smokywok. Looking at your kimchi just make my mouth water. At the moment i got my kimchi from the supermarket.. i hope one day i can make my own homemade kimchi. This looks great! I’ve tried online kimchi recipes before, but it was difficult to get the taste right compared to other homemade kimchi I’ve had. Hopefully, this one will work for me. =) Would it be okay to refrigerate the kimchi right away or do I need to let it sit out for a day or two? Thank you, Kathy! It will be good. Just make sure to buy good quality ingredients, especially gochugaru. Leaving it out for a day or two (less in summer time) is generally recommended to help with the fermentation process. But, you can put it in the fridge right away if you want to. Hope this helps. Let me know how it turns out for you. Hi Hyosun, I tried another kimchi recipe a few weeks ago and I can already tell yours is more authentic version than what I followed! I just finished mixing the scallions & radishes into the seasoning mix and now waiting an hour for it to sit! -Do you include the lower, white, more fibrous part of the scallions as well as the green part? -And do you have any online sources for quality ingredients like the gochugaru, salt shrimp, fish sauce, and kelp for dashima? I went to an Asian grocer and felt totally buying those ingredients since it was my first time!! Thank you so much for the kind comment on my blog! And thank you so much for this wonderful recipe (as well as your others – they’ve been feeding my Korean food addiction!). I can’t wait to try my kimchi! I really want to try this, but I wanted to ask if leaving the shrimp out would ruin the flavor? We don’t eat shellfish, so can’t use things like shrimp, oyster, etc. This looks so delicious though! Sonya – You can leave out shrimp and just use a little more fish sauce. It will have a slightly different flavor, but the kimchi will still be delicious. Hope this helps. Thanks! What type of containers can be used? Glass only or is plastic okay? I’ve only seen recipes using chopped cabbage and always read that it has to be totally submersed under liquid or it will mold. A good non-reactive (airtight) plastic container is okay as well. Well salted kimchi should not mold. Hope this helps. Thanks! I made this kimchi and it was amazing! I’ve also made the mandu and all of my friends loved it! I don’t live near my mom anymore, so I don’t get to eat her Korean food and she can’t give me her recipes because she just eyeballs everything. I have loved everything I have made so far and can’t wait to make more of your delicious recipes! Thank you so much! Oh your kimchi look amazing. I will try to make your version. Last time I cut the cabbage in a bite size pieces, but yours look so good. I still have about two more servings…and I really want to try making with cucumbers since everybody is saying how good it is. I didn’t set aside for 6-8 hours, just 1 hour, is it ok? Why does the napa cabbage get soggy when I had soaked it in the salt over 6 hrs? There are several things that can cause cabbages turn soft, including the salt or quality of cabbage, gochugaru or other ingredients. 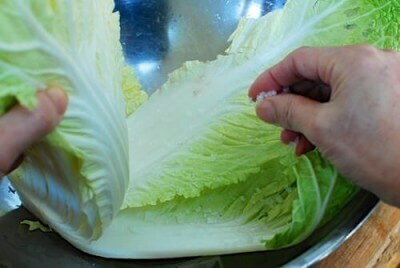 Regarding salt, it’s best to use Korean sea salt specifically packaged for salting cabbages. I’m not sure this helps, but there’s no simple answer without knowing the specific ingredients used. Hi Hyosun. Thank you for this recipe. I left it out for 3 days before putting it in the fridge, as it is winter at the moment. The salt and spicy flavours are perfect but it isn’t sour. Did the fermentation not happen? Can I do anything to help the flavour (like add vinegar)? Hi Orcinus – Sounds like your kimchi turned out really good. As I said at the end of this post Kimchi needs about 2 weeks to develop the full flavors. It takes longer to become really sour. You can leave it out for a few more days to expedite the process, but it will be better if you just let it slowly ferment over a longer period of time in the fridge. It will become naturally sour, which is how it should be. Thank you very much for using my recipe! Cheers! It tastes really good already. Thank you for such a wonderful recipe. I bought a tub of gochujang, before I read this recipe… can I still use it? Hi Channing! You don’t use gochujang for making kimchi, if that’s what you’re asking. 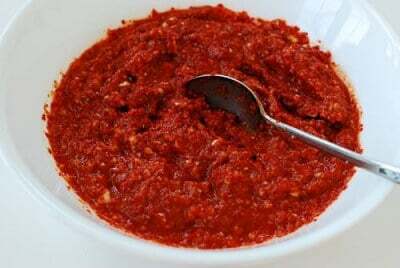 You should use Korean red chili pepper flakes (gochugaru)to make authentic kimchi. You can use gochujang for many other recipes on my blog. Hope you find some good gochugaru and make some kimchi. Cheers! Hi Hyosun. I tried this recipe over the weekend, place it in a container and let it stay in room temperature of 1 day. Hi Kian – That’s quite normal. The cabbage and radish will release water as they ferment. Just make sure the liquid doesn’t overflow by having some room at the top of the container you’re using. You don’t want to lose the delicious kimchi juice. Hope this helps. Please let me know if you have any other questions. Thank you very much for using my recipe!! I’m in a college microbiology class and our teacher gives us 5 pts if we make a fermented food at home and bring it to class. I made the kimchi using your exact recipe a couple day ago, and three days from now I’ll share it with my class. Thank you for the very clear recipe! Aww that’s totally awesome! A+ in my book. I’m sure your teacher and class will be very impressed. Thanks for choosing my recipe for you cool project. Cheers! This recipe is so thorough! I am part Korean but did not know too much about Korean food until recently, but this is a great dish to start with! Thank you so much! And welcome to Korean cooking!! Kimchi is not that hard to make. You may also want to check out another kimchi recipe I recently posted. It’s called mak kimchi. Hi, I am Korean and I love that your recipes are authentic, I just made this and I wanted to thank you! If I want to make more kimchi, do I add more ingredients for each cabbage? thank you so much!! Great to hear you made this kimchi! Yes, just use more ingredients proportionately. Doesn’t need to be exact though. Thanks for using my recipe!! Hi Hyosun! Your recipes are clean and remind me of my mom’s. 🙂 I love reading your posts. 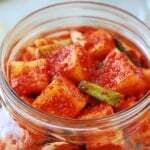 One question I had was why kimchi doesn’t require sterilization of the glass jars like western pickling does? I worry about botulism, which is why I tend to stay away from home pickling (western style). Thank you! I’m glad to hear my recipes remind you of your mom’s. To me, it’s the ultimate compliment. Kimchi is absolutely safe! Here are a couple of articles I think will help you understand the difference between canning and fermenting. “Can I get food poisoning from fermented foods? Hi, I am trying to make this now. I bought two small nappa cabbages that are about 6 lbs in total. I cut them in halves, to 8 pieces. My bowl isnt big enough so I have to put 22 cups of water. Do I put 4 1/2 cups of coarse sea salt? Hi Chef Michael! Thanks for your love for Korean food and my blog! 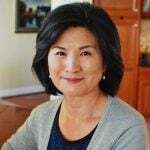 I’m honored that you are using my recipes for your Korean cooking. Look forward to hearing more about your culinary journey through Korean food. Cheers! Hi! I made this again for the second time and this time I used double the recipe. The first time I didn’t use myulchiaekjeot sauce, I used the Viet Huong 3 crabs fish sauce and now I used the myulchiaekjeot sauce that you have in the picture but the myulchiaekjeot sauce gold version from hmart, is that the same?. If I want to make it more salty using myulchiaekjeot sauce, what do I add more of? and how much more do I add for one cabbage that’s 6lbs.? It’s the same thing. It just how some brands label theirs gold.If you’re making it saltier, you can probably add 2 to 3 more tablespoons but start with a little, taste and then add more. If you like more pungency from the fish sauce, you can reduce the saewujeot and use more fish sauce. Hope this helps, but let me know if you have any other questions. So happy to hear you’re making your own kimchi!! For those who are struggling with using the paste between each leaf, I don’t bother, I just cut the leaves into bites size pieces (2 inches – cut across each leaf) and then mix everything at once in a big bowl, then place the combined cabbage and paste into storage jars or containers and let ferment as noted. This comes out great, and no fuss. I’ve been your fan for quite a time and finally tried to remake your pogi kimchi. The sauce is great (though no shrimp added), but it’s too salty – I blame the salt, which was italian brand. My question is whether sticking radish disks into kimchi might help to dilute the saltiness. Another issue is whether my mistake will inhibit the ripening process (+28 C, so I thought 1 day out of the fridge would be enough – it’s 4 days old already yet fermentation signs are scarce). Thank you for your hard work here! Thank you for being a long-time fan! Types of salt make a big difference. I wish there was universal salt everyone could use, but unfortunately that’s not the reality and you just have to adjust the amount depending on your salt. Sure adding radishes will help dilute the saltiness. Also add some water. You will have lots of kimchi juice, but that’s never a bad thing since you can use it for so many things. 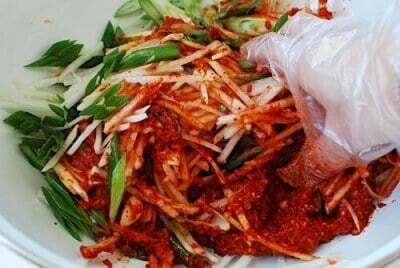 Salty kimchi will ripe slowly, the reason kimchi is made saltier in the Southern regions of Korea, where the weather is warm, to slow down the fermentation process. If you kept at room temperature for 4 days, it should start bubbling up. I’d suggest that you add radishes and water and place it in the fridge and forget about it for a while (2 to 3 weeks at least). Hope this fixes it, but let me know how it goes. That’s awesome, Alice! You deserve great tasting kimchi. After a few times making it, you’ll become a kimchi expert. Thank you so much for your post! My roommate and I used this recipe two weeks ago. I was really excited yesterday to finally open up the container and try the kimchi, but they were sooooo salty. I couldn’t even eat them! I thought it could be that after salting the cabbage for releasing the water, I washed them thoroughly for only once, instead of 3 times. Do you think that’s the cause of the problem? I washed them really thoroughly though. Or was it the type of salt we used? We bought coarse salt from H-Mart…. They have been fermented for two weeks already. Do you think there is still a way to fix the problem? I really don’t want to throw them away since we put so much effort in it! I’m sorry to hear that. You really have to wash the salted cabbage thoroughly 3 times to wash off the lingering salt. If you used coarse salt and the right amount, that had to be the reason, assuming the salt level in the seasoning was right. You can add some water (be generous) to dilute, and if you can get a Korean radish or two next time you go to the store, cut it up and add. It’s not the best time to do this after two weeks, but it would still help. Also, the salt level reduces as the kimchi ferments, so give it a time. You may even want to keep it at room temperature to help expedite the fermentation because salty kimchi takes longer to ferment. Hope this helps, but let me know if you have any questions. So it looks like you’re in the DC area. Do you go to a VA H Mart? Oh something else occurred to me. The napa cabbage are not in season these days and very small and light. Did you use just one? You would have needed to use two cabbages for this recipe to have 5 to 6 pounds. Also, you can cut up the kimchi and mix with a cut-up cabbage or radish (of course do not salt) like mak kimchi (See my mak kimchi here: http://www.koreanbapsang.com/2013/10/mak-kimchi-simple-kimchi.html#.U5TLmFhdVX4). This will be an easier fix. Sounds good! Yes, I live in the Fairfax area. I think I should do a meet up with the readers in the area one day. That would be fun. Cheers! Hi, I really want to use this recipe , but I don’t eat shrimp. Would it change the taste if I left it out, or is there a substitute I could use? You can leave it out. If you don’t want to use salted shrimp either, then just use more fish sauce. The taste will be a little different but it will still be delicious. Let me know if you have any other questions. Thanks for using my recipe! Thank you for your recipe. I have failed many times making kimchee because I could never get the salt/water/napa ratio right. I made poggi kimchee last week and it was a success! Even my husband approved. BTW do you notice big difference between napa bought in the summer vs. late fall? Should I make any adjustments? Your suggestion would be most appreciated. Congrats on your successful kimchi! Summer cabbages are smaller and less tasty/sweet, but you really don’t need to make any adjustments. Just try to find good cabbages. It’s really been hit or miss for me around here. Thank you! Any tips on converting this recipe to vegan? Omit shrimp and fish sauce. You will need to use more salt to season. The stuffing needs to taste slightly too salty to eat as is, so adjust your salt amount based on that. If you have a good Korean soup soy sauce (not regular soy sauce), you can add a little too. And sorry about the late reply. I was on travel. P.S. Is poggi kimchee the same as baechu kimchi? Generally, baechu kimchi refers to any kimchi made with napa cabbages. Poggi kimchi is the one you make with the halved or quartered cabbages with a stem that holds together the leaves, and makkimchi is the one made with cabbages cut into small pieces. Either one can also be called baechu kimchi. After producing (3) large glass quart jars of this delicious looking stuff, I let it ferment at room temp for one day before placing it in the refridgerator as instructed. It appears I have about a 1/2″ of headroom in each jar. Have you ever had a jar/container explode? Would there be any harm in opening the jars periodically to release pressure? I have had homeade root beer explode and that was sticky but this would be… like something that my house would never smell the same after. (1) week down, (1) more until I can enjoy some delicious things made from it like Kimchi Fried Rice! Thank you for sharing the wonderful recipe. Doesn’t it make you feel good to look at all those jars of kimchi you made? I’ve had the kimchi juice overflow because I didn’t leave enough room for expansion during the fermentation process. Kimchi generally doesn’t produce that much gas for the jar to explode. It’s better to be left alone until you want to eat, but opening the jars is okay. Enjoy! I cracked open the small jar that i let ferment at room temp for 3 days because I wanted to enjoy it quickly. It is amazing. I cannot wait for the two week jars. I am going to try kimchi fried rice among other things. So happy for you! 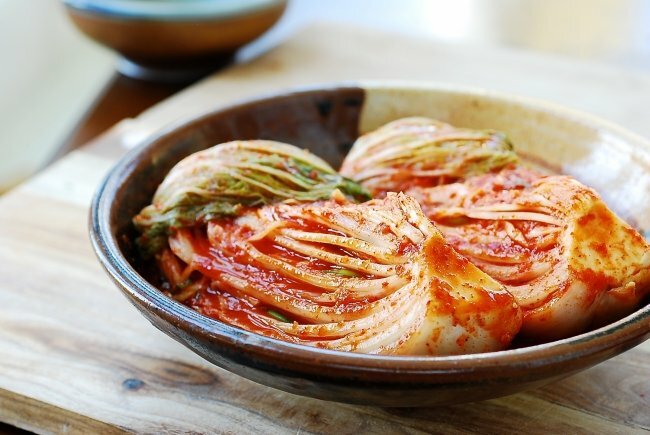 Yup there are so many dishes you can make with well fermented kimchi. Enjoy!! Can I add in carrot cut into matchstick size? And can I check if you have missed out green onions in yr recipe? If so how much to add. Got most of the ingredient and I can’t wait to try. Hi Habibah! Sorry this is a bit late. For Korean kimchi, you must use Korean chili pepper flakes or powder for authentic taste. That doesn’t mean you can’t experiment with other chili pepper powder or flakes. Also, I am not sure what type of chili powder you have in Malaysia. In the U.S., chili powder typically includes other spices such as cumin, oregano, etc., which is not appropriate for authentic kimchi. Hope this helps. I just spent the day making this awesome recipe. I spent 2 years in S Korea and it turned me into a kimchi snob. The random stuff in my town just doesn’t cut it. Anyways quick question…I’ve finished the whole process and my kimchi is on day 1 in the fridge. I’m noticing a lot of liquid accumulating should I pour it out a bit or no? Should I be flipping the cabbage quarters or just leave them alone? Kam-Sam-ni-da. Hi Tyler – Yep! If you’re a kimchi snob, you have to make your own kimchi. Once you are used to homemade kimchi, it’d be hard to go back. No problem with the liquid you’re seeing. It’s quite normal. Don’t flip the cabbage quarter. Just leave them alone until you start eating. Enjoy! So I’ve copied your exact recipe a few times now and all I can say is WOW! When I was living in Busan for a year I made the trip to Jeon-Ju to visit a friend and try the local Bibimbap because the region was famous for it. Anyways, my Samoan friend and I went for lunch at a place and it wasn’t the Bibimbap we were admiring, but the insanely good kimchi. We talked about how good it was for months (maybe years) and I’ve never tried anywhere close until I tried yours. This kimchi recipe is an absolute gem and arguably the best kimchi I’ve ever eaten. I live in Canada now and brought some of my kimchi to my Korean buddy and his wife who run the supermarket down the street. They were literally speechless at how good this recipe is. They both agreed it might be some of the best they’ve ever tried also. Just wanted to say thank you for this and let the people on here know how lucky they are that you’ve shared this. aww that’s totally awesome! You just made my day and put a big smile on my face. Thank you so much! I must say you must have implemented the recipe really well. I went to Jeonju when I visited Korea last year. I had lots of great food there as well. Hi! I found you via Google+ — I am in a kimchi phase. Made my own for the first time a few weeks ago and have been using it in all sorts of recipes — and eating it on it’s own. This recipe looks wonderful — I love how the cabbage is kept in such large chunks. That’s awesome! You make your own kimchi. Much better, isn’t it? Hope you try this traditional version as well. Thanks for stopping by! THANK YOU so much for this post! While my husband was deployed they stopped in S Korea and he tried some REAL HOMEMADE Kimchi. He fell in love and has not been able to find some authentic Kimchi. I plan on making this and presenting it to him as a birthday gift next month!! I KNOW he will be THRILLED! Thanks again!! Aww that’s so sweet of you! Sounds like it will be a great gift. Hi! I did your kimchi but because i did not put the shrimps, i added extra fish sauce and i think the kimchi is very salty now! Is there any way to save the kimchi if its too salty? U mentioned that kimchi is good after two weeks. Its currently the 9th day… If it be less salty after two weeks? Salty kimchi will ripe slowly. You can taste now and see how it is. The salt level reduces as the kimchi ferments, but if you think it’s too salty, you can cut up a Korean radish and add to the kimchi. It’s not the best time to do this after 9 days, but it would still help. thanks for sharing your recipes and knowledge. I’ve been following your blog for a while, and it’s always a pleasure. I’m rather fond of kimchi and can buy some original Korean products but would prefer it less hot. Now I want to try to make some myself, using your recipe. I’m familiar with fermenting vegetables, and all my recipes tell me to pay attention to the fact that the vegetables must be covered by fluid in order to prevent unwanted germs from developing. You don’t mention it specifically in your instructions, so I’ld like to ask, especially as raw shrimps are involved. The main difference here is the salt level. The cabbages are pre-salted, and the seasoning is pretty salty as well. 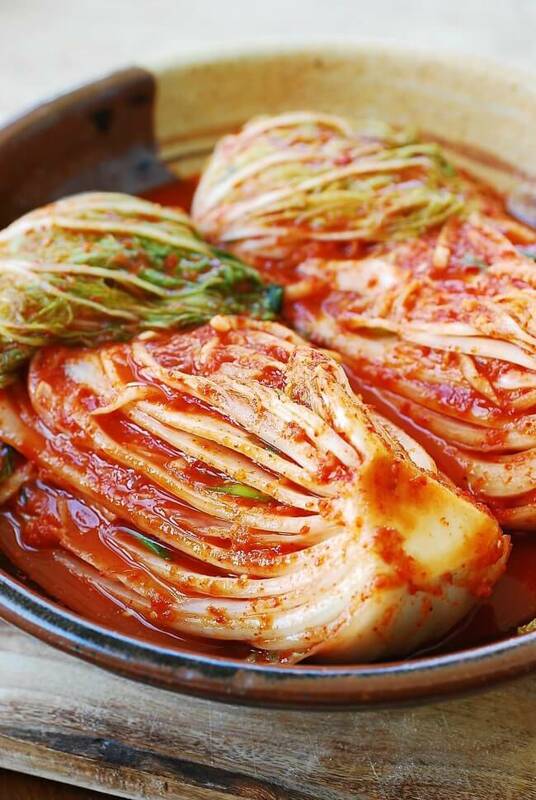 This type of kimchi doesn’t typically have sufficient liquid to cover the cabbages, but no need to worry about spoiling because of the salt level. Hi Hyosun,in this recipe,you didnt use sugar for seasoning right? And can i make this kimchi without salted shrimp?Thank you so much. Right. It’s not necessary. Yes you can make kimchi w/o salted shrimp, but you will need more fish sauce, if using, or salt. Thank you for your recipe.i did it yesterday. i followed all your instruction but it was too salty.I hope it will be good later. Is it Korean fermented salted shrimp? The Korean salted shrimp is usually sold in the refrigerated section. It’s very salty and doesn’t actually freeze even in the freezer section. So defrosting is not necessary. Because of the salt level and fermentation, it also doesn’t spoil easily. So I am not sure why the jar says you can use it only for 4 days. Just keep it in the freezer and use it next time you make kimchi. You can also use it to season soups. Hope this helps. Hi. if after you salted the kimchi and washed. can I set aside it for a day without making the paste if you have no time? thank you! It should be okay in the fridge, covered. Just wash once to get rid of the most of the salt, keep them in the fridge, and finish washing when ready to use next day. 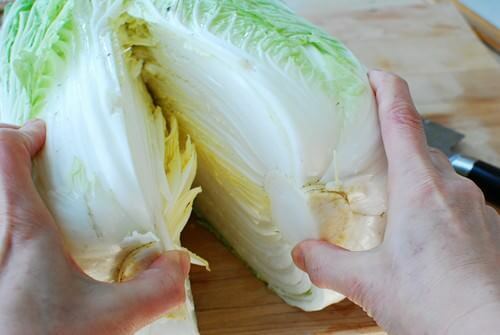 A little bit of the salt level will help keep fresh, but too much salt left will make the cabbage too salty. I received a nice fermentation pot for Christmas and I can’t wait to get my first batch of kimchi started! Thank you so much for the wonderful recipes and the easy step by step directions! I don’t have a 2nd fridge to use – can I leave the pot outside in the garage or in the shed or does it need to be refrigerated? All depends on the temperature of the garage or the shed. Anything higher than the fridge temp will make your kimchi go sour too fast. Your recipe is like pickled cabbage. Maybe next one I’ll add the pear to balance out sourness. Not sure what happened. That’s not the usual feedback I receive on this recipe. Not using pear should not have made that much difference. Did you have all the right ingredients? I love eating kimchi and thinking of making it myself and your recipe looks great. However I have problem looking for Korean chilli flakes but I managed to find Korean chilli powder. 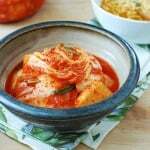 Can I substitute the flakes with powder and will it affect the kimchi taste. Actually they are the same thing. Hope you try making it! What is napa cabbage? I live in The Netherlands, and your napa cabbage looks just like the local Chinese cabbage we have here. Will the chinese cabbage here do? Yes, they should be the same or very similar. Hope you try it. I’m a big fan of your site and recipes. Love the detailed recipes and interesting techniques. After following this one and the 1/2 cup water under “seasonings”, my kimchi turned out a little more watery than expected. Could you please confirm that the 1/2 cup water is correct? Thanks, and keep up the great work! Thank you, Harvey, for being a big fan! And I am so glad to hear you are making your own kimchi. Yes, 1/2 cup is right. That’s not too much water for kimchi. Were the cabbages drained well after being washed? Did you use the specified amount of gochugaru? 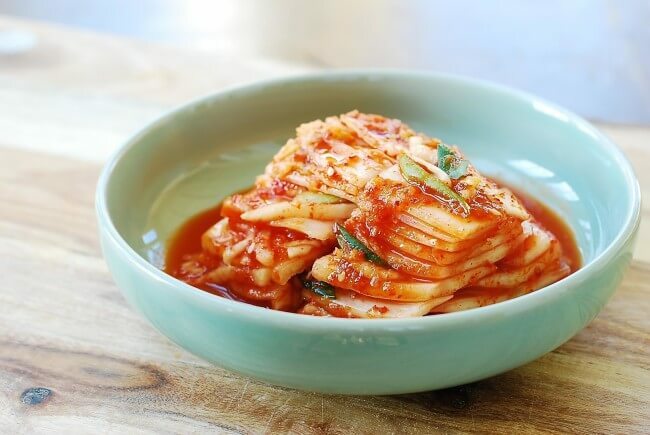 A little extra kimchi juice can be useful in kimchi jjiage or other kimchi dishes, but if you think it’s too watery, reduce the amount next time. Hope this helps. I’m really looking forward to trying your kimchi recipe! How much myulchiaekjeot should i use to replace the saeujeot (I can’t get any where I live)? I also can’t buy mu. Can I just leave it out or should I replace it with 1 extra pound of napa cabbage (just worried that the cabbage might be too salty without the mu)? Thank you for showing the way how to make KimChi. I wonder how many type of Kimchi? I understand more when I watched the movie Kiet Tac Bat Hu which was translate to VietNamese. I will try to make it next week. Hundreds! Hope you enjoy it. Thanks for coming by, Thuy! Thank you so much for this recipe! I’ve just found out I have a severe rice allergy and am really missing my favorite foods. Is there anything that could replace the glutinous rice powder? the raw shrimp. It’s really delicious and shared some to my friends. Thank you for the inspiration. That’s a lot of ginger for the amount of cabbage, but glad to hear you liked it. Thanks for letting me know! I’m excited to have discovered your blog! Korean food makes me really happy, especially all the kimchi. Thanks so much for sharing this – looks wonderful! Stumbled upon your blog the other day, your children are very lucky to have a mother like you! I was just wondering – when you leave the kimchi at room temperature for a day or two, do you open the lid daily to let out any gas? Actually, can you just leave it out for 2 days at room temperature, and then transfer it to the fridge for 2 weeks and then open it? Thank you, Jeff! You don’t have to open the lid, but two days out at room temp is usually too long, especially summer days. That may cause too much gas at once. 1/2 day to a day is recommended, and you can transfer it to the fridge and open it whenever you like to eat. Hope this helps, and sorry about the late reply. Thank you! I actually ended up leaving it 2 days because although it’s summer, I’m in London – so the indoor temperature is a bit cooler especially in the evening. It is a little little little bit too sour but otherwise it’s amazing! I’ve nearly eaten half of it and it’s not been 2 weeks yet, I just couldn’t wait – so naughty haha! I love cabbage so going to try this kimchi. ? Great! hope it turns out well for you. Hi! Thank you for writing such a detailed description ^^. I reallly missed kimchi ever since moving, especially my mom’s. When I asked her for tips, she mentioned putting raw pork meat to ferment with the kimchi or squid for another. Can I just add them to your recipe? Thank you!! No I wouldn’t add raw pork to this kimchi recipe. Not safe. Squid should be okay but I don’t recommend you use it in summer kimchi. Very traditional and welcome Kimchi recipe. I love this recipe and have used it multiple times with excellent results, without modifying it, with the exception of the Asian pear, since it was not available where I live. Finally, this last time the pear was available. It was perfectly ripe and I used most of it instead of a 1/4 of it, because I was bad and didn’t read how much to use. My question is: the pear pieces have turned purplish/black in the skin and lines in the meat of the pear, is this normal? It does not smell rancid, the cabbage looks normal. I am afraid that somehow I might have killed and it is spoiled and not safe to eat. What do you think? I hope you can help, and thank you! Great to hear you’ve successfully used this recipe multiple times! Thanks for letting me know. Regarding the pear, it’s hard to tell, but it sounds like the pear was not fresh or bruised. If you didn’t think it was that bad when you cut it, my guess is kimchi should be okay. Hi, I am looking forward to trying this recipe. Can kimchi be prepared as vegetarian? without the fish sauce? Can i substitute? look forward to hearing from you. I have a vegan kimchi recipe on the blog. Hope you try it. This looks delicious. I lived on kimchi and rice when I was pregnant LOL. There’s some kimchi in my near future. No, not expecting again. 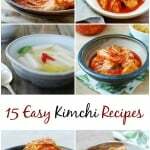 My husband is Korean and I would like to try making kimchi. The whole family enjoys it so much and am wondering if I should invest in a crock for fermenting or just stick to a glass jar. I would appreciate your thoughts! Just made my first batch last night and will let it ripen for a full day. The seasoning mixture tastes really good and i can’t wait to try the kimchi after a week or so in the fridge. I think i put too much of the seasoning mix in the first 3 quarters of the cabbage and really had to scrape the down to get some in the last one. Hopefully the liquid will penetrate that one and give it decent flavor. I’m already looking forward to my second batch! Practice makes perfect..
im always afraid to eat this or that and how it will affect my stomach , but using kimchi at every meal ,I never have problems ,and am free to eat many of the things I like , like noodles,an occasional hamburger,an occasional dish of french fries ,and all the foods were told after a certain age starting mostly in our 50s are best not to partake…after soo much caretaking and dieting over food ,what I can eat ,what not to eat ,with using kimchi at every meal I just eat and never suffer with bad digestion.im sure many could explain the scientific reason for this ,I cannot , but I know how my tummy feels and its O.K. I have been looking for nice recipe to assist volume intake of fermented food. When I got to know of Korean kitchen- via movies I knew I’ve arrived. Hi I love to eat kimchi…I did not know that they have different kinds. Where can I buy the ingredients. Is it ok if I cut down the salt ‘coz I am cutting down my sodium intake. Hi Kasia! Depending on how fast you want your kimchi to ferment, I’d suggest you leave it out a half day to a day. Hope this helps! Hii I’m mantasha and I indian I love Korean food .your recipe is super easy to make and delicious . Is rice flour the same as rice powder? I actually grew up with a korean-german stepmother here in Germany and so I am in deep love with Kimchi. I actually never made it myself and as I cannot ask my stepmother anymore I’d just like to check one thing. It really doesn’t matter. You can use any jar or non-reactive container with a tight lid. Traditionally, kimchi was kept in earthenwares with no air-lock or airtight lid. Hope this helps. Hi! I love the kimchi recipe! Is there a substitute for the gochugara Chili flakes and the glutinous rice powder? Thank you! Glutinous rice powder you can skip, but gochugaru is an essential ingredient for traditional kimchi. Hope you can find it somewhere. I’m going to head to the nearest Asian grocer I’ve found in may area in hopes of acquiring these ingredients!! Is it acceptable to story the kimchi in glass mason jars for the end of this recipe? Yes, it is! Sorry about the late response. Sometimes comments go straight to the post without my approval, so I missed this. Thanks for the recipe! I, however, missed washing the cabbage (step 4) and it was too late before I realized. What are the consequences of this other than the taste? oh if you didn’t rinse off salt water on the surface of the cabbage leaves, kimchi might turn out too salty. You can check that by tasting a little. Also, if you didn’t rinse the cabbage, your kimchi might contain dirt or grit. Anything I can replace the glutinous rice powder with? Or can I skip it? I will try to make this! Thanks for the recipe. I came looking for a recipe cuz I am too cheap to buy it in a store. now I have found an entire new kind of food to fixate on. thank you so much for sharing. I was taught that this was “water” kimchi. I was taught to salt, and, chilli flake, garlic then add next leaf. do this several times and then roll up and pack into a glass jar. let ferment, take a roll out daily and slice crosswise. Hello, I am reading over your kimchi recipe and I am thinking of making it. My husband loves kimchi. I noted in your pictures that it looked like you put some of the kimchi in a plastic container. Can you store the kimchi in a plastic container? Thank you. Your kimchi looks delicious. Thank you! It can be, but should be non-reactive plastic container. Is this recipe gluten free? It looks delicious and I would like to try making it. I cannot tolerate any gluten. As far as I can tell, but be sure to check the particular ingredients you’re using to make sure. I love Korean foods but I am a terrible cook. I enjoy watching your cooking skills. Thank you! Start with easy recipes and work your way up! It’s really doable. Have you tried your recipe with myeolchijeot ? 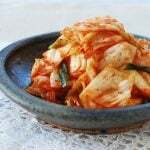 Thank you for sharing, I made a kimchi using this traditional recipe and am now waiting for the flavors to develop. Question though: I now have an almost full but opened jar of salted shrimp (saeujeot) in my fridge but am unsure how long I can store them? Any other suggestions on what to do with these shrimp? Oh nice! Happy to hear you made kimchi. Hope it turns out well. I keep my saeujeot in a freezer bag in the freezer. It won’t freeze because of the high salt content but will keep well. 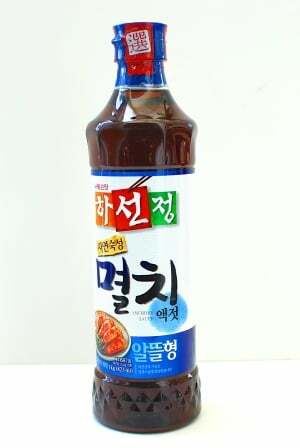 Use in the stews and soups such as kongnamul guk, kimchi kongnamul guk, kimchi jjigae, etc. It’s also great in gyeran mari (rolled egg omelette) and gyeran jjim (steam eggs). OR make a different kimchi like radish kimchi (kkakdugi). This sounds amazing! If the ingredients are available on Amazon would you mind sharing the links of the brands you prefer?